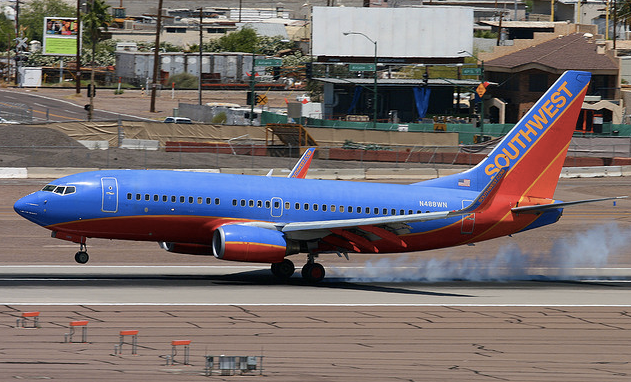 For the second time this week, a Southwest Airlines flight had to be investigated because someone thought it would be hilarious to waste everyone’s time by making bomb threats for flights between San Diego and Dallas. The first incident occurred Monday, when threats against Southwest flights reportedly popped up on Twitter. At least one flight, en route to Southwest’s home at Love Field in Dallas, was in the air when the threats were spotted. The plane landed safely but authorities are now investigating the threat. Then around 6 a.m. PT this morning, a threat was received for another flight headed from San Diego to Dallas. This plane had yet to leave the airport, so authorities were able to check it over and give it the all-clear before allowing it to take off. Only a few months earlier, a Seattle-area man phoned in bomb threats to Southwest with the intention of ruining his ex-girlfriend’s vacation. He later tried to claim that he didn’t technically make a bomb threat, he merely lied when he said his ex was carrying a bomb. What really annoys us about these repeated threats is what a massive waste of everyone’s time and money they are. Passengers have their flights delayed or canceled; police have to take time away from investigating other crimes; delays with moving flight crews around the country can have a ripple effect, causing later flights to be held up or canceled. And while you may say “boo hoo” to a large national airline losing money, remember that these losses aren’t shrugged off. These costs result in higher airfares, more fees, staff cuts, and general corner-cutting, putting everyone at risk.